Fall is my absolutely favorite season. I love the weather. I love the colors. Red and orange have been slowly making their way into my color palette lately, and I’ve been thinking of knitting a fall colors sweater. It’s been percolating in the background for quite a while now, but I’ve never quite gotten around to it. A few weeks ago, I finally decided that I want something a little on the light side, and lacy. 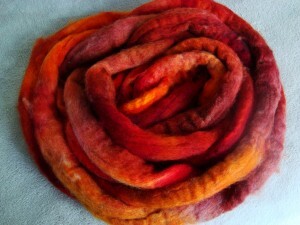 Last weekend, I indulged in some dyeing time for myself, and came up with 12 oz oz of Finn in vibrant fall tones. I wanted to calm the colors to meet the earth tones (to make it wearable for me), and I wanted to end up with fairly subtle shading in the final yarn, so that I can knit lace. I also wanted to keep all the variety and purity of color that goes with the season. That’s a bit of a tall order. I ended up dyeing two separate colorways, one for each ply. 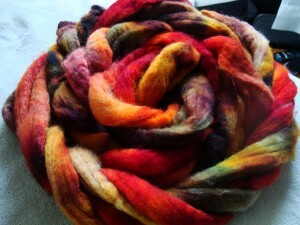 I’ve been thinking of experimenting with spinning mixed-ply yarns, and this seemed like a good opportunity. 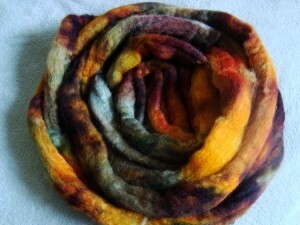 I dyed one colorway with the browns and olive greens, leaning all the way down to gold. And one with the bold reds and oranges, to keep them from mixing with the brown and muddying. The color segments are relatively large, so there should be fairly long stretches of a single color that then gradually fade into the next with spinning. I’m hoping that the brown ply will ground the reds when they’re plied together, and that having two separately varying plies (with relatively similar color values within each one) will limit the amount of variegation I get in the final yarn. I’m not sure that any of that will come out as I’m hoping it will, but so far I really like the looks of the two colorways wound together. I can hardly wait to see how this comes out. Should be lovely. Thanks you for sharing with us. Ooh, I’m intrigued to see how that will turn out. I love fall too–the cooler temperatures, fall foods, pulling the knitting out of the closet. I need to work on a fall sweater too–I have one started in reds but it’s been long neglected in favor of lace. I think it’s about time to change that, though. I can’t wait to see your plied yarn! Cannot wait to see how it turns out. Love both of them separately, especially the top one! Oooohhhh. That is going to be a great combo! I have done some mixing of different colorways in one yarn by way of plying and I really think your colors will work beautifully together. Have fun with it. Really lovely stuff! Looking forward to seeing your finished garment(s)! I was out running tonight, looking at maples and ashes and spruce, and I swear this is true, was thinking “Erica needs to be dyeing these colorways”. You really captured them! Just beautiful! DesigKnit is powered by	WordPress 4.8.9 . Page generated in 0.289 seconds using 39 queries.